* the reason i re-made these 4 times is because i was playing around with the amount of maple syrup required to make them stay together. 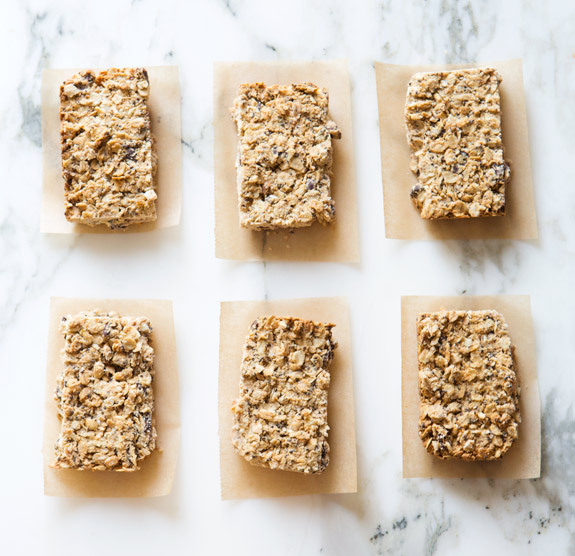 1/4 cup makes crumbly bars with a consistency i prefer, but if you want to take these traveling with you or prefer a less crumbly bar, increase the amount of maple syrup all the way up to 3/4 cup! 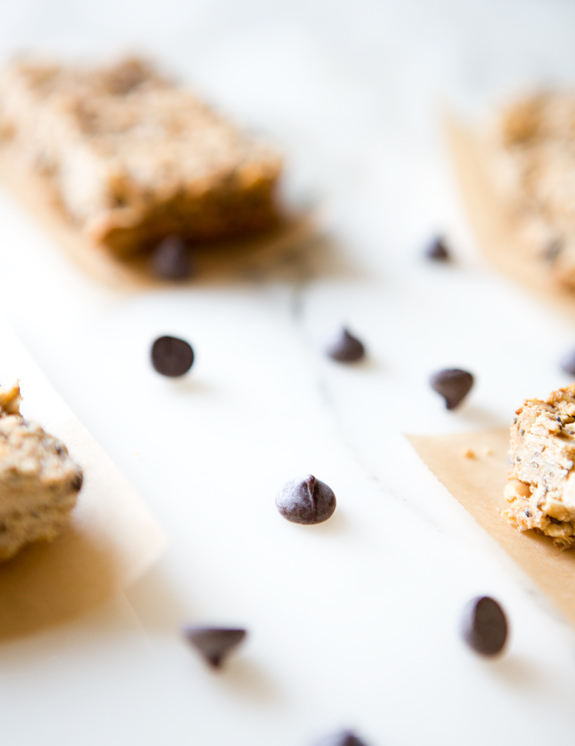 and feel free to play around with the additions, raisins could replace chocolate chips for an even healthier snack! these look sooooo good! and i've got your apricot bars in the oven as we speak! my second time makin' em. love! Made these today, and they were yummy! Thanks for the recipe. 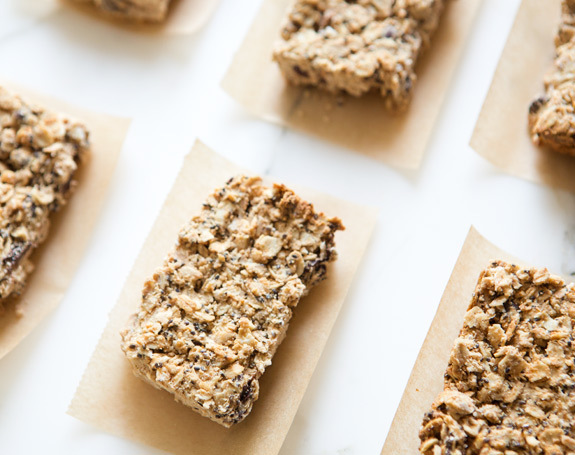 These look delicious and perfect for snacking on a hike! Do you think they would last a few days in the fridge if I make them ahead of time? These were incredible. My husband raved about them. I subbed sunflower seeds for the almonds and cacao nibs for the chocolate chips and reduced the baking time by a couple of minutes bc the sunflower seeds were starting to darken. But so good! 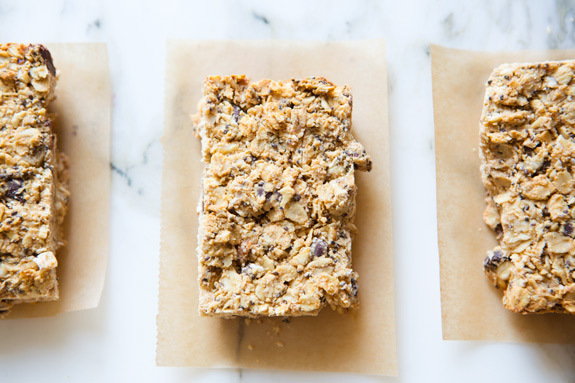 Best granola bar recipe. these look so great! quick question: when do you cut them into bar shapes – before or after the fridge? Hi Sarah, these were fantastic! You're right, they were too delicious to last long in the fridge. My mom, sister, and myself devoured two batches – one with chocolate chips and one with craisins. I can see what you mean about melting on a hot hike, although they were perfect for a chilly hike at 10,000 feet. Thanks for sharing this recipe, it will be a staple in my house! Hi, i don' t have maple syrup at the moment but can I replace it with honey? Hi, I don't have maple syrup at the moment and I was wondering whether I could use honey instead? Hey! Thanks for this simple recipe. One question though–have you tried replacing almond butter for peanut butter? This is something I'd like to do but don't know what it would come out like. can you bake these in muffin tins instead? how many grams are 1/4 cup maple syrup?